• Trevor Andrews - Theodore High School/He is striving to earn a sports scholarship so he can pursue his plans to become a Physical Therapist. • Catherine Bryson - Cottage Hill Christian Academy/She plans to attend the University of South Alabama and graduate with a Biomedical Science Degree and plans to work for a Masters in Physical Therapy. • Bailey Davis –Theodore High School/She plans to attend the University of South Alabama to study Business and work as a Real Estate Agent. • Sara Hilbun – Cottage Hill Christian Academy/She plans to attend the University of South Alabama to pursue career as a Nurse Anesthetist. • Ashley Hines – Mobile Christian School/She plans to attend the University of Alabama for a Pre-Veterinarian degree, then continue her studies at Auburn University. • Lilli Swearingen – Cottage Hill Christian Academy/She plans to pursue a degree in Nursing. The T.A.L.L. 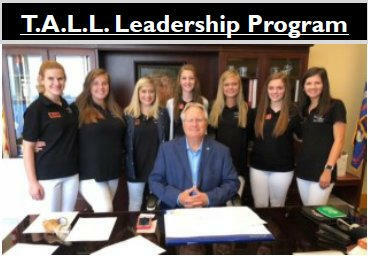 Leadership program was created 5 years ago and has been a success throughout the community. The students are given the opportunity to visit the Mayor while attending council meetings and pre-council meetings. They also attend lectures hosted by local business men and woman in our area while receiving instructional education with insight of day to day practices of how to run a business successfully. 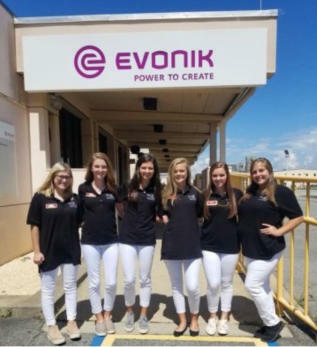 They also tour industrial plants, career centers, local schools while they find time to volunteer and help host events sponsored by the chamber. Each student has a 4.0 or above GPA and is very deserving of participating in our program and have excelled in the class room and on the field as athletes. Since its inception, the chamber has given away over $30,000 in scholarships to our T.A.L.L. students. Each scholarship totals $1,000 and is given to each student that completes the program. This program has been funded by grants and fundraising efforts of SouthWest Mobile County Chamber of Commerce. As in previous years, we are looking to our sponsors in the community to assist funding these scholarships. We would like to give you opportunity to sponsor a student this year. This is an opportunity to make this sponsorship in memory of a loved one or in honor of a business person, family or friend. If you or your business would like to take part in sponsorship please contact Tina Poiroux at the Chamber Office (251)666-2488.